It’s interesting to consider these big picture themes as it’s all to easy to get locked into details in specific projects. They can be seen as new industries in their own right, but they are also transforming business models across many sectors as they deploy vast datasets to identify better ways of doing complex tasks – from helping doctors diagnose medical conditions more effectively to allowing people to communicate across the globe using instantaneous speech recognition and translation software. The move to cleaner economic growth – through low carbon technologies and the efficient use of resources – is one of the greatest industrial opportunities of our time. By one estimate, the UK’s clean economy could grow at four times the rate of GDP. Whole new industries will be created and existing industries transformed as we move towards a low carbon, more resource-efficient economy. The UK’s road and rail network could dramatically reduce carbon emissions and other pollutants, congestion could be reduced through higher-density use of road space enabled by automated vehicles, and mobility could be available when we want it, where we want it and how we want it. The prospect of longer lives will require people to plan their careers and retirement differently. Ageing populations will create new demands for technologies, products and services, including new care technologies, new housing models and innovative savings products for retirement. The first three you could see as predominantly technological challenges but the fourth is far more complex as it will need to take into account inter-generational attitudes and mindsets. A good example of a cross-disciplinary project. 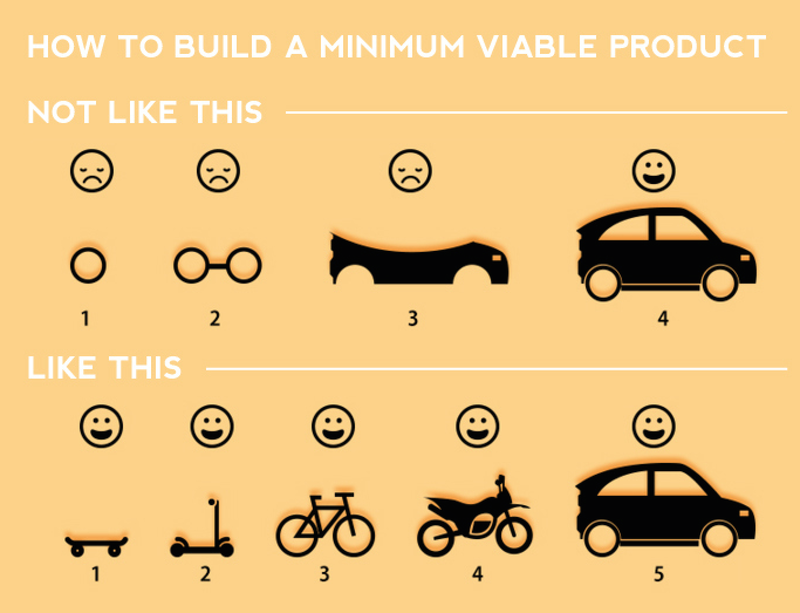 What’s your Minimum Viable Product? I think this is a really brilliant graphic, it really gets you thinking – which route am I (perhaps unintentionally) taking? Pity about the awful name though, Minimum Viable Product. It applies to developing ideas and plans of course, not just commercial products. One of the most important figures in quantum mechanics was the German physicist Max Planck. After he won the Nobel Prize for physics in 1918, he undertook a lecture tour of Germany. “Naturally enough the lectures he delivered to the various audiences were more or less identical, a fact that was noticed in due course by his chauffeur. Charlie Munger, Warren Buffett’s business partner, often tells this story. He uses it to illustrate the difference between real understanding of a subject – “Planck knowledge” – and the mere appearance of it, or “chauffeur knowledge”. The “chauffeurs” of this world often distract attention from their shortcomings by putting on a great show. They may have a commanding presence, a way with words, huge self-confidence. In every walk of life – politics, business and, yes, journalism – you get both types of knowledge. And of course you get both in fund management. Almost all fund managers can persuade you that they are a suitable person to entrust your life savings to. Sadly, the facts show many aren’t up to the task. Choosing the right fund manager is one of the most important financial decisions we’ll ever make. Being able to distinguish those with chauffeur knowledge from those with Planck knowledge would be a huge help. How can you tell them apart? Here are a few suggestions. First, can they explain what they are doing in simple language? It’s the chauffeurs who seek refuge in jargon and obfuscation. Second, do they ever admit that they don’t know the answer to a question? It’s the Plancks who have the self-confidence to admit ignorance when the circumstances call for it. And the third, related test is whether they are aware of their own “circle of competence” and avoid being tempted to invest in areas that they are not properly familiar with. You can of course replace fund manager with any other sort of manager! I appreciate that in practical situations admitting ignorance may easily be viewed as a weakness. I guess it works provided that you have the opportunity to clearly demonstrate your strengths so that people can get a rounded and balanced picture. I had a meeting with a friend yesterday where we discussed the key ingredients for successfully developing new ideas/startups etc. In particular, the differing roles that emotions and logical thinking play in making decisions that stick. We may utterly lack confidence–we may even suspect that failure is a near-certainty. But that determination has no bearing at all on our ability to be courageous in the face of those long odds. The issue isn’t the likelihood of failure–the issue is the relative cost. The key to untangling this confusion lies in understanding these two qualities and how they differ: Confidence is a calculation of the odds of success. Courage is a calculation that the cost of not trying is higher than the cost of failing. But above all, Ameringer was funny. Life and Deeds of Uncle Sam: A little History for Big Children (1909) sold over half a million copies, and his autobiography, If You Don’t Weaken (1940) is a joy to read. It’s available on Google Books here. His views on politics are thoughtful, cynical, gentle and astute, and he doesn’t take himself too seriously. Other similar and amusing videos from Duarte here. As always, it’s easy when you know how! Applying this to business (or other) problems, the point is to try thinking about the issue from a variety of quite different viewpoints even though that may initially seem quite alien, strange or unproductive. This situation reminded me of the time when I was an academic and one year there was quite a fuss over a (physics) exam question that had been set. You could work it out from first principles and it would have taken about 30 mins for an average student. This assumes no slips were made along the way (and the greater the number of steps the more likely that this is to happen). However, by using a conservation principle, you could also work out the answer in about 5 mins! To do this this you needed to think a bit differently right from the start and not get trapped into immediately using the standard approach. Even though some spotted this, as the question was so ‘easy’ using this insight, they were then worried that they were misunderstanding the original question! As you can imagine, this resulted in a lively discussion of what constituted a ‘fair’ exam question. In practice, it’s helpful to know how to do it both ways of course, as one often elucidates the other. You can read about the topic of thought experiments in the original post by Michael Michalko here.